TORONTO, March 8, 2017 /CNW/ - Treasury Metals Inc. (TSX: TML) ("Treasury" or the "Company") is pleased to announce the results from an updated Preliminary Economic Assessment ("PEA") integrating recent engineering and incorporating the 2015 NI 43-101 Mineral Resource Estimate from its Goliath Gold Project ("Goliath" or the "Project"). "The updated 2017 PEA benefits from increased mineable resources and a higher grade profile while using a more conservative approach related to all mining costs, capital costs and dilution compared with the 2012 PEA. As such, Treasury will confidently move forward with a Feasibility Study in addition to the other development activities set forth in our March 1, 2017 corporate update. The revised PEA is the result of all the considerable progress made at Goliath over the past five years and represents a key milestone in the path towards a production decision," said Chris Stewart, President and Chief Executive Officer of Treasury. Goliath is located in northwestern Ontario, lying 20 kilometres east of the city of the Dryden. The total area of the Project is 49 km2 and is owned 100% by the Company. The site benefits significantly from excellent access to infrastructure and is directly adjacent to the Trans-Canada highway and Canadian Pacific Railway. The Project has access to electrical and natural gas power, rail, paved roadways to site and several nearby communities. The optimized mining plan used in the PEA envisions an initial open pit generating immediate revenues to fund underground development. Underground ("UG") production begins in the second year with the open pit operating over an additional 7 years at a reduced output to supplement UG production to a total of 2,500 tonnes per day over the course of a 13 year total mine life. Total gold production is estimated at 1.14 million ounces of gold and 2.0 million ounces of silver. Initial capital to fund construction is estimated at C$133.2 million with an additional C$132.5 million in sustaining capital over the LOM primarily to fund the underground expansion. The mine is proposed to produce an average head grade of 3.81 g/t gold and 10.55 g/t silver with Open Pit and UG mining producing average grades of 1.58 g/t and 4.87 g/t of gold, respectively. The infill diamond drilling programs completed since the PEA completed by Treasury in 2012 (the "2012 PEA") has resulted in improved project economics and overall confidence in the mine plan. The stripping ratio of waste rock to mill feed has been reduced to 6:1, which represents a 35% improvement over the 2012 PEA. This stripping ratio does not include pre-production stripping of approximately 1.3 million m3 cubed of overburden material. All mined ounces in the open pit are within the Measured and Indicated categories. Seventy per cent of the mineable ounces within the Underground are classified within the Measured and Indicated categories which represent a significant increase from the 2012 PEA. UG production is envisioned to be carried out at an average rate of 1,600 tonnes per day using the long hole stoping method on 30 metre sublevels. Average UG operating costs have been estimated at $77/tonne, a 28% increase over the cost assumption in the 2012 PEA. The 2017 PEA was prepared by CSA Global Canada Geosciences Ltd. ("CSA Global") with the assistance of P&E Engineering Consultants and the Company's operations and exploration teams in collaboration with a range of industry consultants (see Qualified Persons section below). The PEA was prepared in accordance with National Instrument 43-101 and the technical report that summarizes the results of the 2017 PEA will be filed on the Company's website and on Sedar (www.sedar.com) within 45 days of this press release. Table 1 presents a summary of the life-of-mine gold production information and other key highlights of the Project. All amounts are in Canadian Dollars except the realized gold and silver price which is quoted in US Dollars. All grade and oz. values are quoted separately as gold and silver unless specified as equivalent ounces, with 1 oz Au = 110 oz Ag, calculated by base case metal prices as listed in Table 1. According to the cautionary statement required by NI 43-101, it should be noted that this assessment is preliminary in nature as it includes Inferred mineral resources that cannot be categorized as reserves at this time and as such there is no certainty that the preliminary assessment and economics will be realized. CSA Global concludes that under base case assumptions of 2,500 tpd production and US$1,225 per ounce (base case – 3 year trailing average gold), the Life of Mine post-tax net present value (NPV) of $306 million based on a 5% discount rate, internal rate of return (IRR) of 25.0% and a payback of 4.1 years. The payback includes all UG mine development costs. Resource Expansion: The resource remains open both at depth and on strike. The PEA has also taken a conservative approach to the exclusion of several areas of inferred resources. Specifically, the PEA has excluded two zones of mineralized material that are separated approximately 300 metres from the underground main resource area to the east and west, respectively. These areas represent approximately 84,000 oz combined and highlight the potential of resource expansion via open strike extensions. Reduction and Optimization of Capital Expenditures: Availability of used equipment on the market and/or the option of leasing equipment have potential to significantly reduce capital costs. For example, used Open Pit, UG equipment, and used milling equipment such as a SAG Mill could be sourced and would replace more expensive and long lead time expenses used in the PEA. As the Project progresses, there will be continual options to explore using leased equipment and/or contract mining to lessen the upfront investment needed depending on the market conditions as the project is initiated. The Company will continue throughout the Feasibility study to evaluate all potential options to increase the economics of the project. Mine Plan Optimization: Presently, the UG development costs in the PEA are based on contractor rates for certain equipment and personnel. With the purchase of equipment and use of company personnel, the overall UG development cost could be significantly reduced in the sustaining capital section. Further optimization of open pit mining phases, along with the current infill drilling programs, could help to reduce the stripping ratio in the initial years while providing optimized grade directly to the mill in the initial years of production. In conjunction with optimized phase design, the PEA has also elected to not use any low grade stockpile. Further optimization of mining could make use of a low grade stockpile to provide an increased open pit head grade being fed to the mill prior to the initiation of UG mining. Process Optimization: Further optimization of the gold processing plant could help to improve economics by reducing operating costs and increasing gold recoveries. It has been recommended to study the use of oxygen injection into the leaching circuit to both speed leaching times and reduce cyanide consumption. A further advantage is the ability to operate the slurry leach circuit at a lower pH that favours the carbon adsorption step and together with the accelerated leach kinetics can allow a significant drop in leach tank volume requirements, significantly lowering capital costs. The Company announced a detailed corporate update and project development strategy on March 1, 2017 to further advance the Company's Goliath Gold Project. The Company's key objectives for Goliath and proposed timelines related to a Feasibility study and mine permits were provided in that report. The Company will provide additional details related to Tailings Management and Closure process in conjunction with the filing of the PEA on Sedar in April 2017. In a similar method to previous studies, the PEA proposes an initial open pit mining plan to take advantage of mineralized material at surface. Revenues generated from open pit mining will be used in the development of the underground operations. In an effort to optimize the mill head grade, the PEA envisions that UG mine development will start immediately in year one with the objective of creating underground mill feed by year two. It has been proposed that once UG production is online the open pit production will decrease over an 8 year period to supplement the UG mill feed to the nameplate capacity. As proposed, the open pit will operate over an 8 year mine life and uses no significant stockpile from the storage of low grade material. This will have the additional benefit of reduced re-handle costs for the low grade stockpile that was proposed in previous studies. Total gold production is estimated at 1,142,000 ounces of gold and 2,075,000 ounces of silver of which it is proposed that 154,700 ounces of gold will be from the Open Pit and 987,300 ounces of gold will be produced from the Underground. The PEA is based on an average milling rate of 875,000 tonnes per year, or 2,500 tonnes per day with an average head grade of 3.81 g/t gold and 10.55 g/t silver. Metallurgical and optimization studies continue to indicate high recoveries using a traditional Carbon in Leach (CIL) circuit and estimated overall recovery of 95.5% for gold and 62.6% for silver. Initial capital to fund construction is estimated at C$133.2 million with an additional C$132.5 million in sustaining capital over the LOM primarily to fund the underground expansion. The main increases in the capital costs since the 2012 PEA came from advanced engineering studies to support the mine permit process and the major cost changes attributed to the tailings facility, closure costs and open pit pre-production costs. The total mill facility includes costs associated with a backfill plant for underground production and the Company will make use of existing office, warehousing and electrical facilities onsite to minimize capital costs needed for construction. Advanced engineering studies also helped to revise operating cost estimates. The PEA has defined a $18.15/tonne processing cost, $3.45/tonne for open pit ore mining, $3.30/tonne for open pit waste mining and $77/tonne for underground mining costs. Underground development costs have been estimated at $6,000/lateral metre and $4,500/lateral metre for contractor and owner rates, respectively, with a total of 14,725 total metres needed for capital development. A standard carbon-in-leach (CIL) circuit with gravity extraction is considered the base case for the proposed processing facility. An average of 2,500 tonnes per day will be primary crushed with a jaw crusher and then ground to the target leaching P80 of 106 microns using a single stage SAG mill and classifying cyclones. A gravity circuit consisting of a scalping screen and centrifugal concentrator will be fed from the cyclone feed distributor. The gravity concentrate will be batch treated in an intensive leach reactor (ILR) with the pregnant solution treated by electrowinning. Cyclone overflow will pass through a trash screen prior to entering the carbon in leach (CIL) circuit. The PEA has provided for a 24 hour leaching residence time in the 6 tank CIL circuit with a cyanide detoxification circuit to be used prior to discharge to the tailings facility. Average processing costs have been estimated at $18.15/tonne over the course of the mine life. All metallurgical testing to date, which includes Teck Resource's previous 2,375 tonne bulk sample and the most recent 420 kg representative sample, has shown extremely positive results for this proposed circuit. Recoveries are estimated to be 95.5% for gold and 62.6% for silver. 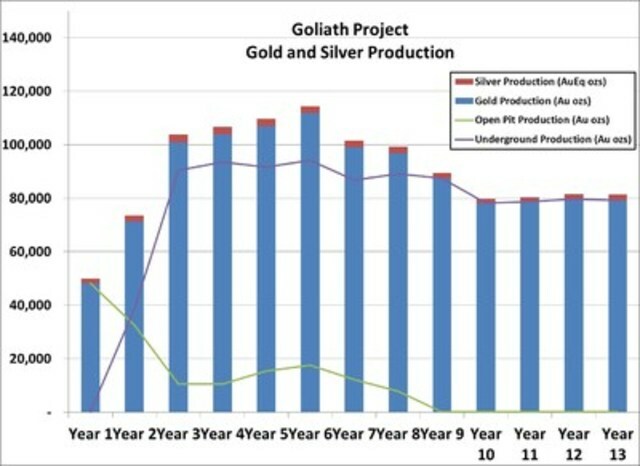 The attached chart provides an overview of the gold and silver production. The following table summarizes the 2015 NI 43-101 Mineral Resource Estimate in the "Measured", "Indicated" and "Inferred" Resource categories. The report is available on the company's website and on www.sedar.com. A gold price of US$1,397/oz and silver price of US$22.93/oz based on the April 30, 2015 three year trailing average prices and an exchange rate of US$1.06=Cdn$1.00 were utilized in the AuEq cut-off grade calculations of 0.35 g/t AuEq for Open Pit and 1.90 g/t AuEq for Underground mineral resources. Open Pit mining costs were assumed at Cdn$5.00/t for mineralized material, Cdn$3.15/t for waste rock and Cdn$2.00/t for overburden, while Underground mining costs were assumed at Cdn$70.00/t, with process costs of Cdn$13.81/t, G&A of Cdn$2.72/t, and process recoveries of 95% for gold and 70% for silver. The Au:Ag ratio used for AuEq was 82.68. A bulk density model averaged 2.76 t/m3 for mineralized material. Totals in the table may not sum due to rounding. Technical information related to the PEA contained in this news release has been reviewed and approved by Douglas Roy, M.A.Sc., P.Eng., an Associate Mining Engineer with CSA Global, who is an independent Qualified Person as defined by NI 43-101, with the ability and authority to verify the authenticity and validity of this data. The PEA technical report will be filed on Sedar within 45 days. Technical information in the press release has also been reviewed and approved by Mark Wheeler, P. Eng., Director Projects, who is a Qualified Person for the Goliath Gold Project under the definitions established by National Instrument 43-101. The 2015 Mineral Resource Estimate was prepared by Eugene Puritch, P.Eng., Antoine Yassa, P.Geo., and Yungang Wu, P.Geo. of P&E Mining Consultants Inc. of Brampton, Ontario, Independent Qualified Persons ("QP"), as defined by National Instrument 43-101. Treasury Metals Inc. is a gold focused exploration and development company with assets in Ontario, Canada and is listed on the Toronto Stock Exchange ("TSX") under the symbol "TML". Treasury Metals Inc.'s 100% owned Goliath Gold Project in northwestern Ontario is slated to become one of Canada's next producing gold mines. With first-rate infrastructure currently in place and gold mineralization extending to surface, Treasury Metals plans on the initial development of an open pit gold mine to feed a 2,500 per day processing plant with subsequent underground operations in the latter years of the mine life. Treasury Metals is currently in the mine permit process and working towards completion of a Feasibility Study on the Goliath Gold Project.